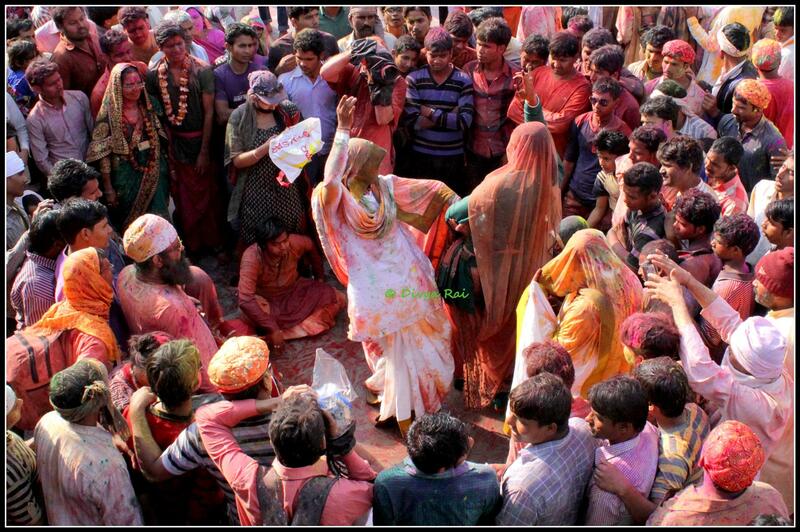 Holi is a very popular festival, celebrated in north India largely. Just in case you are going to shoot the event, read this. Please note: The Holi-celebration at Nandgaon and Barsana takes place approximately a week before the actual date for Holi. There are two villages close to Vrindavan. One is called Nandgaon and the other one is known as Barsana. Nandgaon is Lord Krishna’s birthplace and Barsana is Radha’s (his beloved). Radha-Krishna love-story is one of the most famous ones in the Hindu mythology. Even today, a man/woman from Nandgaon would not get married to a woman/man from Barsana. The festival begins on ‘ashtmi’ with ‘laddoo-leela’ at Barsana. We missed this. Taking ‘laddoo-leela’ into account, the celebrations last for two and a half days. 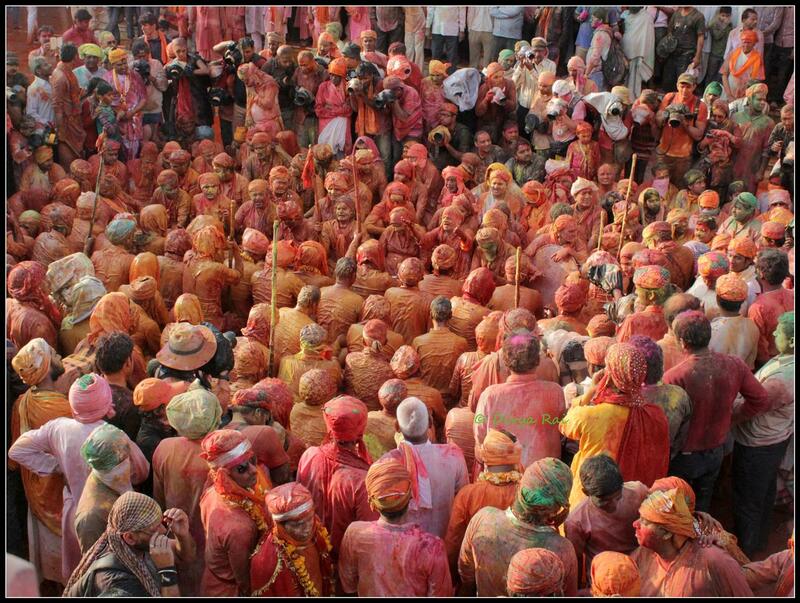 According to the legend, menfolk from Nandgaon visit Barsana to celebrate ‘Holi’ with women from Barsana. When these people come visiting, they are welcomed by these women with sticks and are beaten up. The bunch from Nandgaon comes well prepared for it, with a padded shield to counter the attacks. 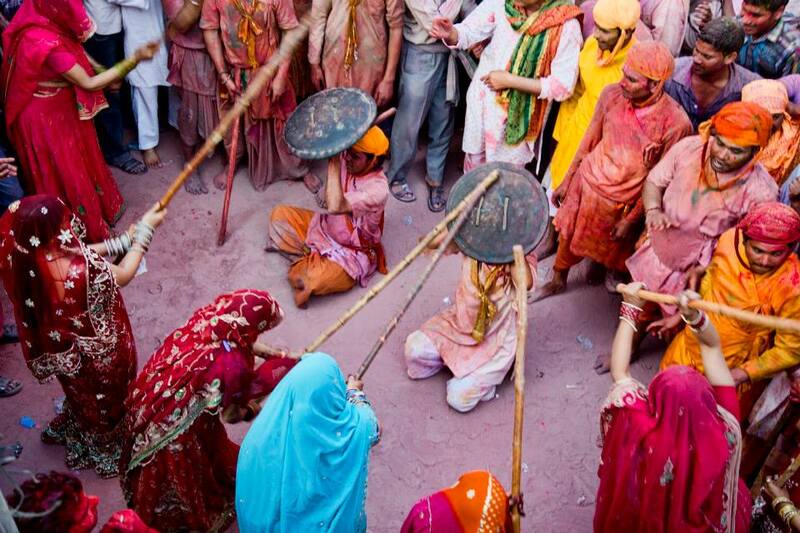 These sticks are called ‘lathths’, hence this holi-celebration is famously known as ‘Laththmaar’ holi. 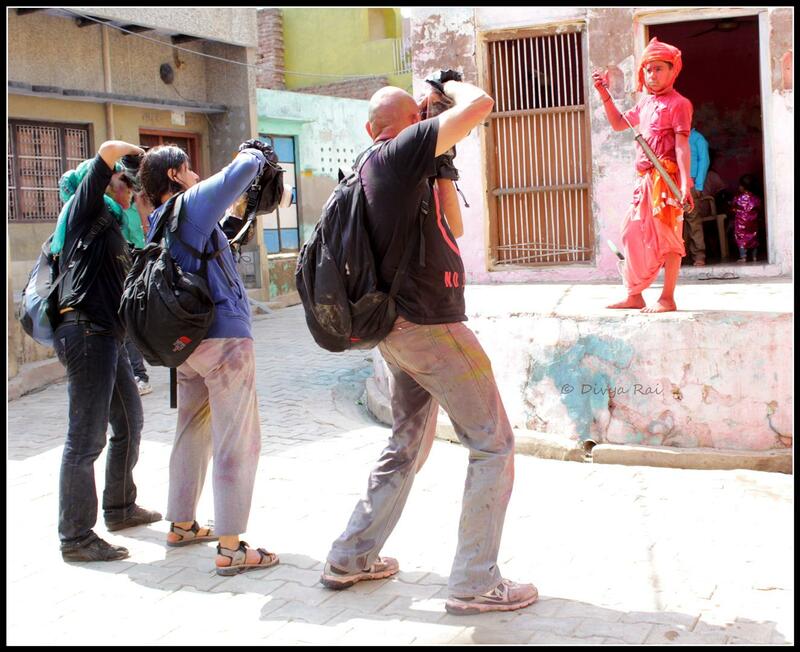 Next day, the women from Barsana (since the women don’t go, men and trans-genders dressed as women represent women from the village) go to Nandgaon to celebrate Holi with the men from the village. They are welcomed with water and colour everywhere, but the main event takes place in the courtyard of Radharani temple at Nandgaon. 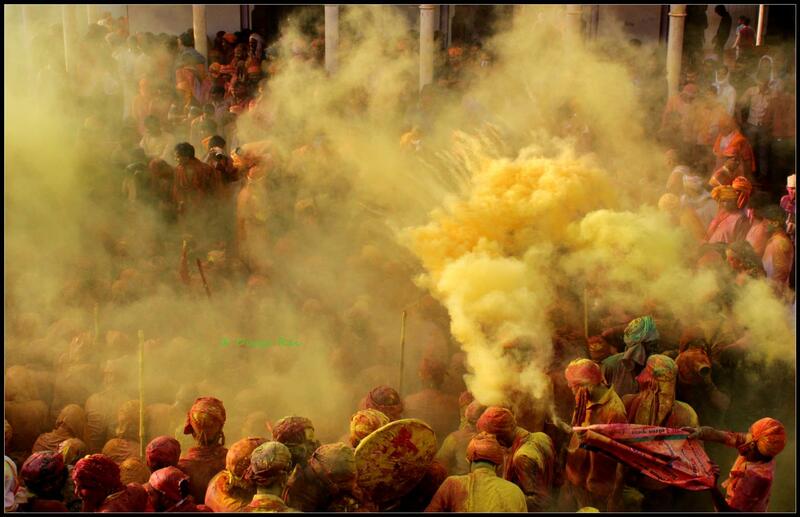 This event marks the highlight of the holi celebration at Nandgaon. During the celebrations at the temple courtyard, people from both the villages sit across each other singing, dancing and conversing and this meet-up is termed as ‘samaaj’. for the main event at the Nandgaon temple (that too, if you get to sit on the rooftop). Apart from these two lenses, what you really DO need is, heavy duty protection for your camera from all the dry colour and water all around. You would need to cover your equipment with some kind of rain-cover. All the while, there is constant shower of water-jets and clouds of ‘gulaal’ everywhere, and keeping the camera safe is quite some challenge. 1) Rain-gear (inexpensive); I used this one. 2) Rain-gear (long-lasting); another friend used this. At one point, this little devil almost bluffed me by changing his course of action from posing to spraying the water-jet, half-way through the click. I barely managed to save my lens from the attack! 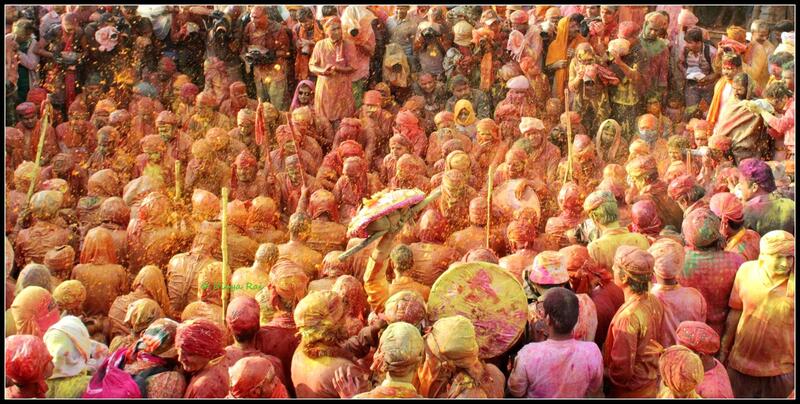 You would need tremendous presence of mind to shoot the streets of Nandgaon and Barsana during the Holi celebrations. 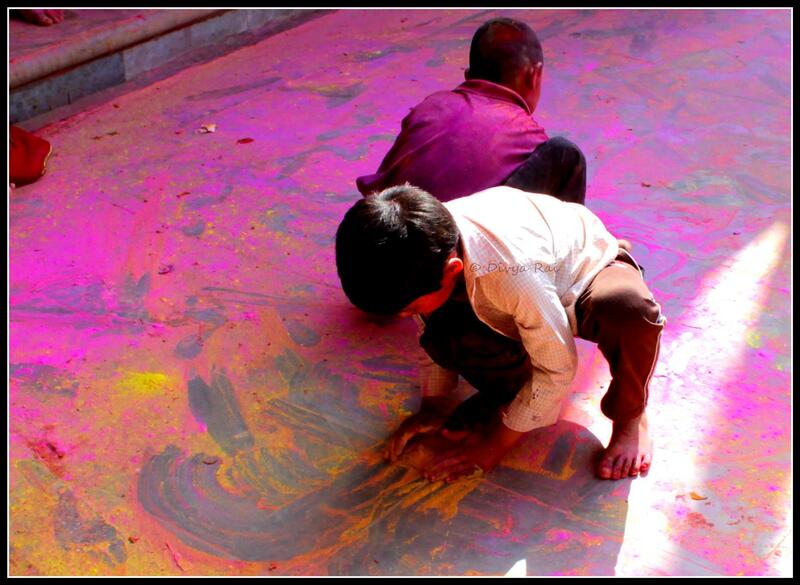 What is so special about this Holi? 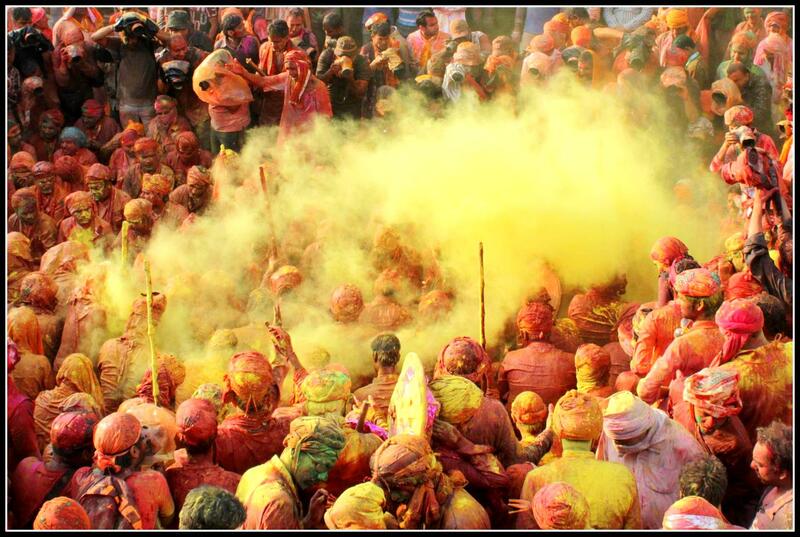 Holi-celebrations at these two villages underline the core essence of ‘ras ka bhav’ – which means, it celebrates the element of spiritual rapture. 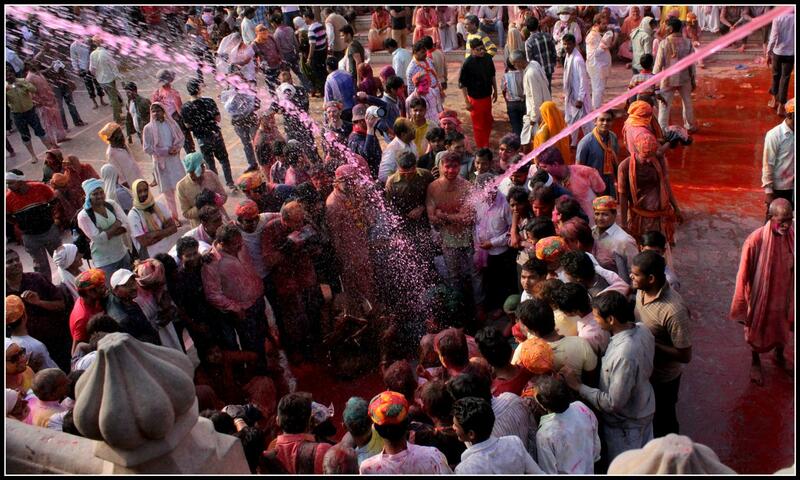 The menfolk play Holi with women in a way which is extremely vocal about their nature of interest in them. It is not sexual in its approach but it has the rustic element of wooing and teasing, which might not go down well you with if are an upright babe from a metro-city. At both these villages, girls are believed to be Radha’s incarnate, and men represent Krishna. All the events are centered around the core-essence of the Radha-Krishna love story. For example, if you are a girl, in Barsana you might get gulaal thrown at (at times, right in your face and into your eyes) and in Nandgaon the water-jets angled awkwardly at your body. This might annoy you to some extent. Before you lose your cool at the local people for being ‘uncouth’, please remember that this celebration is centuries old tradition and you and I are outsiders who have no right to question the culture. 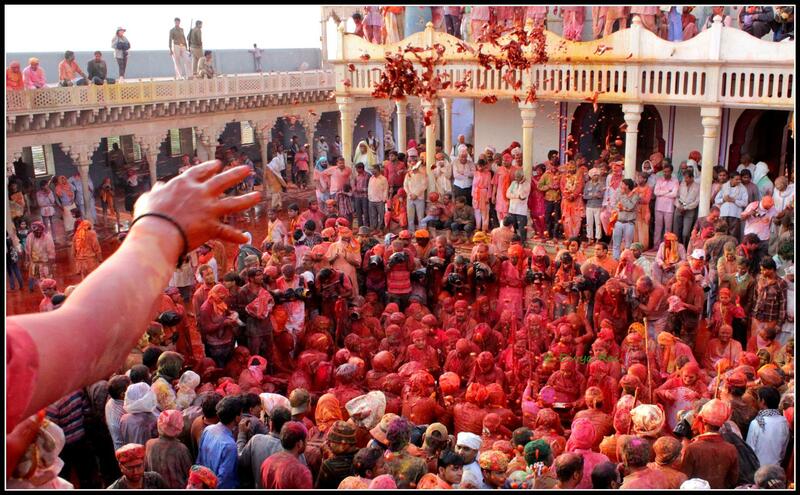 In Barsana, the celebration takes place mostly with dry colour, called ‘gulaal’, while at Nandgaon, it is about both water and gulaal. 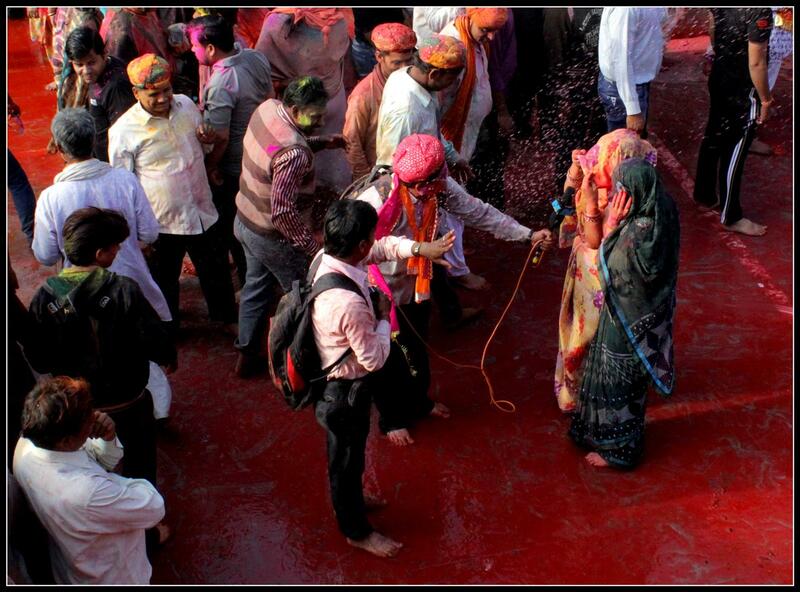 I personally liked Nandgaon celebrations more than Barsana, but it could probably be because I love Holi and celebrate it with great hooliganism.In this entire process, you and your bag will shuttle from dripping wet to dry and back, several times in the day, so please be suitably suited. Please note: If you are a lady, you will be thrown colour and water at, but touching is against the protocol. If some one touches you, it is within the realms of your right to refuse and protest. 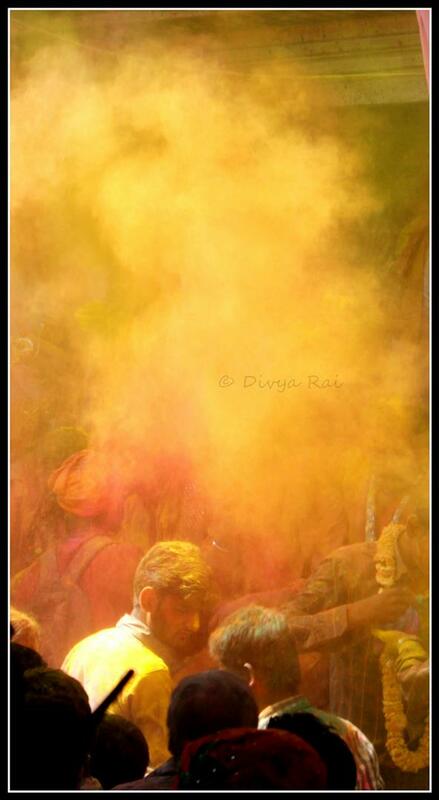 It is a beautiful experience with clouds of colour in the air. The complete visual experience takes a new meaning at Barsana and Nadgaon temples, where the colour is thrown at the devotees by the ‘pandits’ (known as the Goswamis) as ‘prashad’. The greetings of ‘Radhey-radhey’ melts away any mental-barricade that you might have in your head, up against the not-so-holy gang of both the villages. Apart from being an experience of a festival, it is also an exposure to the core Indian value-system of ‘Atithi devo bhava’, coupled with the small-town simplicity. It is something that you will understand only when you are fully aware the entire ecology of the physical space. Also, despite the notoriety of the festival, the villages have amazing security arrangements with policemen deployed at every corner. The main temple is heavily guarded by the Black-cat commandos. It is safe to travel to Nandgaon and Barsana. I travelled with Cerca Trova Travels and luckily, the entire bunch comprised of fabulous people. We reached Barsana at around 11 o’clock on the 9th of March [confusion regarding the dates of the events resulted in very few photographers in Barsana this year]. The vehicular traffic gets cordoned off at about 08:00am, but if you are lucky, the cops might permit you to take the alternate route to the village. If they do not, then you park vehicle 4 km from the village and walk the distance. Barsana, the village, has a temple dedicated to Radha, called the Radha-Rani temple. 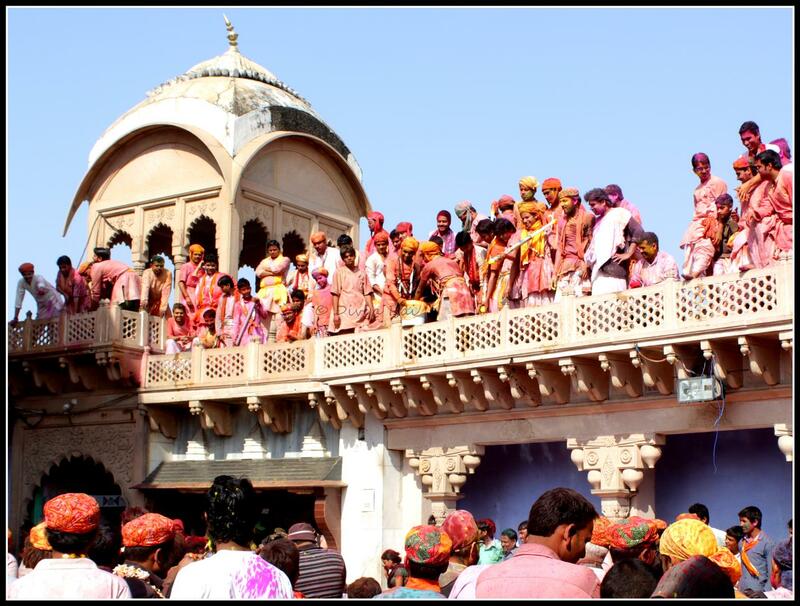 The men-folk from Nandgaon (representing lord ‘krishna’) visit Barsana at around 4:00 pm and with that begins the celebrations of ‘lathth-maar’ holi in the streets of Barsana. As the dusk closes in, the celebrations come to an end. Next day, we headed to Nandgaon. 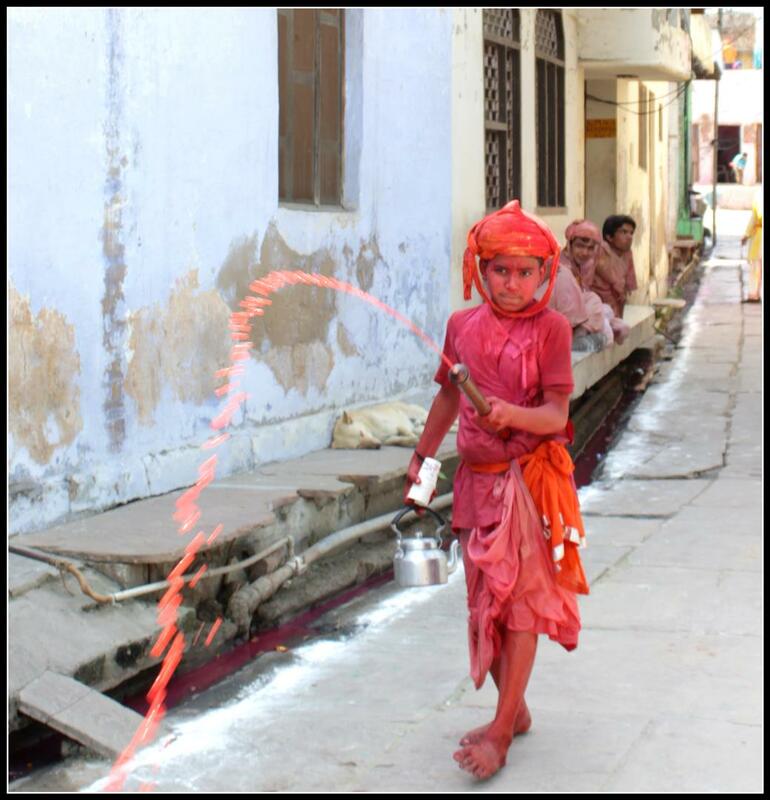 At Nandgaon, there were water jets from ‘pichkaari’(s) and splashes from buckets all around. At moments like these, there is no point running to save yourself from it. One should just make sure that the electronics are safely covered, and enjoy the experience. In this village, we hung around photographing the streets till about 2:00pm, after which we moved to the main temple. Getting to photograph the temple celebrations from the roof-top is purely a matter of luck. The temple management reserves the right to grant access to the roof-top, which primarily, is reserved for the participants of the event. These participants, stand along the edge of the rooftop and throw colour and water down into the courtyard. Soon, the courtyard transforms itself into a visual delight of beautiful colour-explosion! The experience is worth every effort you’ll make to attend this event. 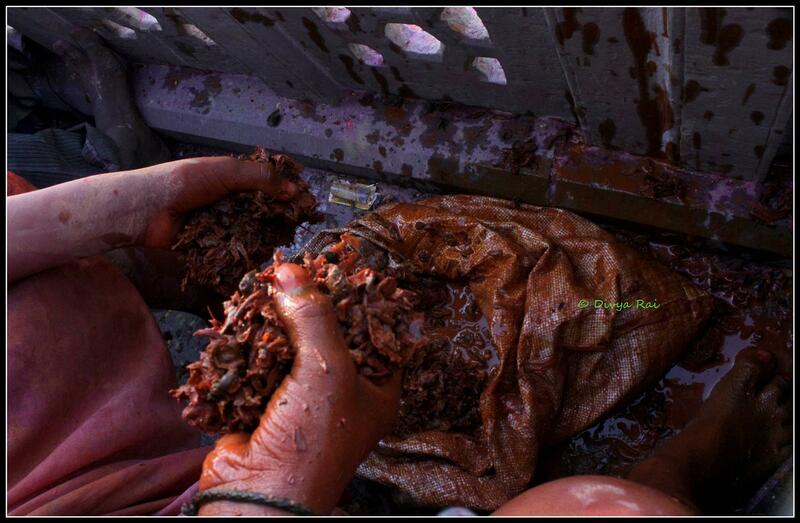 It is believed that the ‘gulaal’ used in both the villages is made from natural sources like flowers, turmeric etc. They are not. It is as synthetic as it can get, and you need to be careful if you are allergic to synthetic colours. You need to be careful even if you are not allergic to colours, for, at times, a hand might appear out of thin air and shove a handful of ‘gulaal’ right into your eyes, rendering you totally blind for the moment. It happened with me multiple times in both these villages. 1) Avoid wearing bathroom slippers. I wore, assuming it to be convenient. 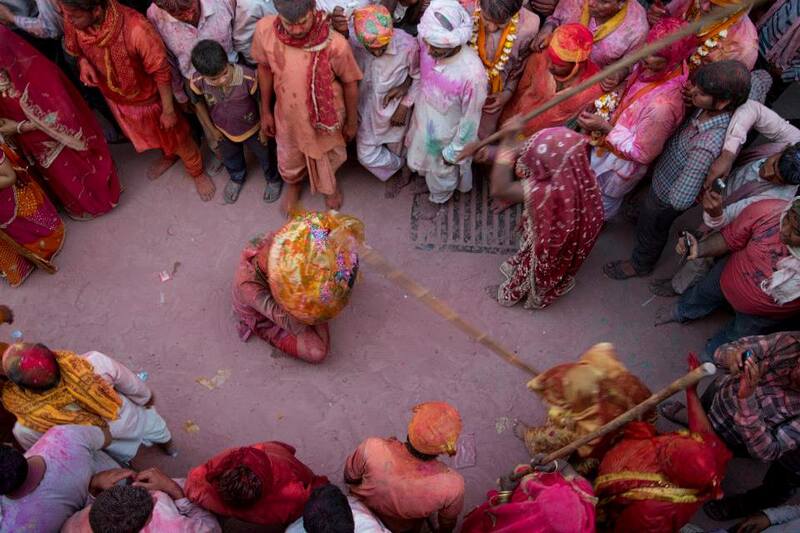 It posed no problem in Barsana, where the celebrations were all dry. In Nandgaon, trying not to slip and fall took 20% of my mind-space at all times. Not worth it. Wear shoes. The ones that do not slip on wet surfaces. This lady was conveniently shooting like all of us. 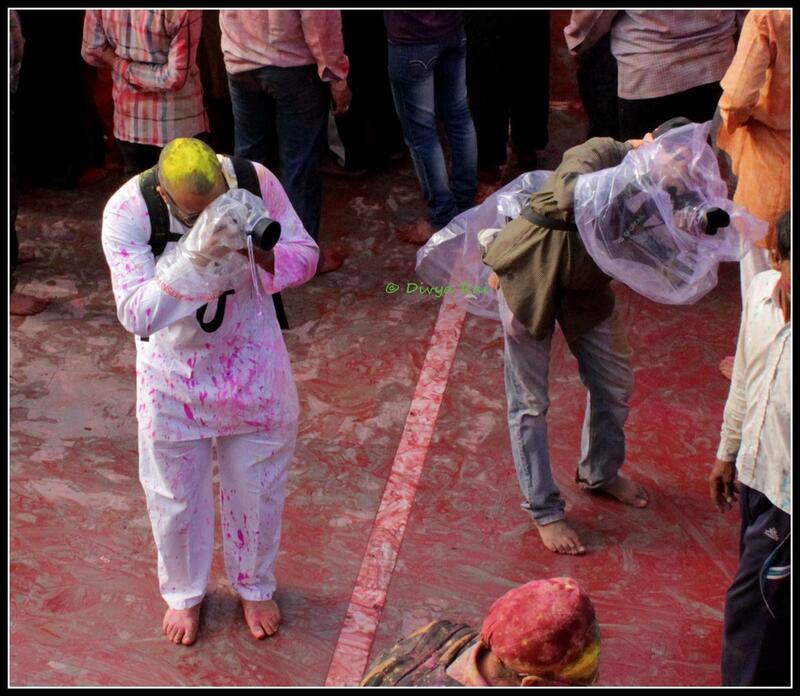 Suddenly, one random guy caught hold of her and smeared her face with ‘gulaal’ , despite the fact that she and her camera, both were covered with polythene bag. She tried running away for a while, but finally gave in. 3) Be polite to the local people. 5) Carry your own food and water. The hygiene level of the eateries is extremely questionable. You will be spending 7-10 hours and you would need to keep yourself full and hydrated. 6) It makes sense to either take your own vehicle or hire a taxi from Vrindavan. Nandgaon and Barsana have poor public transport. 7) Work out your stay well in advance. 8) Stay away if you are asthmatic. The dry ‘gulaal’ in the air is extremely harmful. I am not asthmatic, but I got very unwell after my day at Barsana. At about 4:00 am, I was wheezing and gasping for breath. This is quite unlike me, but I think all the ‘gulaal’ that got into my system during the day acted up. Thankfully, I was sharing my room with a complete angel, who happened to be carrying Asthalin Respsules and a nebulizer. After two Repsules, I was totally free of the bronchospasm. 9) Keep your camera aside for a while and enjoy the experience the way it is meant to be enjoyed. With all your five senses. FB status message, selfie and check-in can wait. 10) Carry sun-screen and a head gear to protect your hair from colors and sun. Barsana is at a distance of 125 kms from Delhi. Barsana and Vrindavan are at a distance of 60 kms from each other. Nandgaon to Vrindavan is 52 kms. Nandgaon and Barsana are at a distance of 8 kms from each other. Nandgaon to Delhi is 115kms. Vrindavan is at a distance of 150 kms from Delhi. Add this to your bucket-list. You’ll thank me. Just in case, you intend to take bhang/cannabis, please read this. Rough on women; COULD end up being a feminist's nightmare. Tough for people with respiratory tract issues. Heyyy … I so wanted to go for this… but couldnot 🙁 Totally using this to plan this next year !!! Awesome picture . U got a DSLR ? Everyone kept on telling me its unsafe but now I know I am so going next year. How much did the tour cost you ? hey divya..nice post..just felt obligated to point one little thing out, I also visited these places this year and I found Barsana to be a lot more interesting and a better visual treat, also you mentioned there were only dry colours in barsana, on the contrary, mine was a pretty drenched experience at the temple there, i’m surprised you missed that…nandgaon was obviously great as well..
Notice the use of word ‘mostly’ in the statement – “In Barsana, the celebration takes place mostly with dry colour, called ‘gulaal’….”. It means that comparatively the celebrations were drier in Barsana. I have no idea if you would like to agree with that. I am not saying that there was no water at all, just stating the obvious difference in the celebrations at these two places. 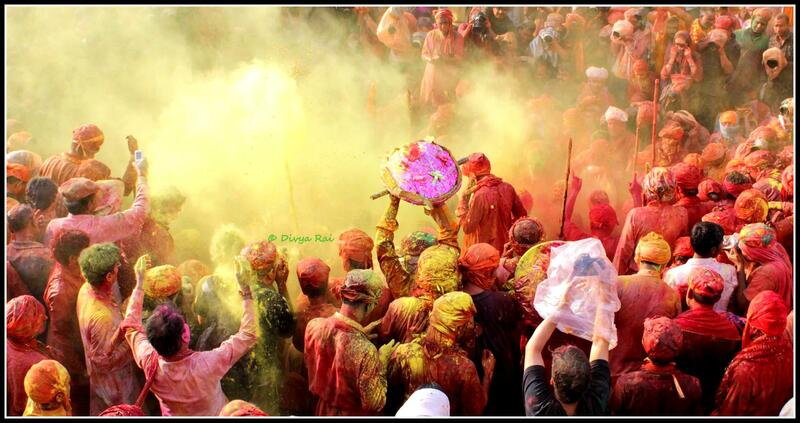 Please feel free to post the link to your version ‘Holi At Nanadgaon/Barsana’, if any, as comment to this post. It might help the people wanting to gather more information on the event. Wow! Beautiful photos & colours. Thanks Divya Rai for guiding me through. It was amazing experience we had in Barsana and Nandgaon. It was electricm vibrant and was so smooth thanks to your Blog. We could not visit Mathura for Holi due to some personal issues. I will love to go back next year as well and continue exploration. Do check out the captures I could click through my lens. I have seen the pictures on this link you’ve posted. I really love the one with a kid. The first pic in the album. Looks like to be 50mm. I usually do not comment on blog posts but this is a genuine piece of writing. Fantastic travel blog, keep it up! From 2014 I’m trying to visit mathura around holi but everyone keeps on saying that it is not good or safe to visit around holi. But after reading your post I’m damn serious to go there on the upcoming holi. Thank you, Rajat! Very kind of you to leave a feedback. I hope you have made note of the dates.